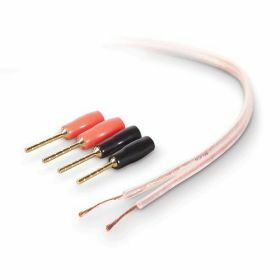 High-Performance Speaker Cable with Precision-Formulated Polyethylene Dielectric Material for High-Accuracy and Natural Sound Quality. 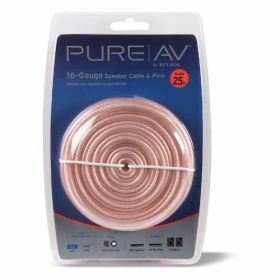 Using advanced engineering methods and the highest-quality materials, PureAV Speaker Cables deliver the purest audio solution available. 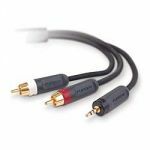 Ordinary speaker cables sacrifice performance by using lower-grade materials, including steel or low-purity copper conductors. This can result in signal loss that causes poor high-frequency reproduction, and sound that is not truly accurate. PureAV's speaker cables use polyethylene dielectrics to maintain signal strength over longer distances. Sixteen-gauge speaker cables improve power transfer over 18-gauge, resulting in natural, more accurate sound. They offer a larger construction and more copper than 18-gauge, which is the recommended minimum gauge for smooth sound reproduction. 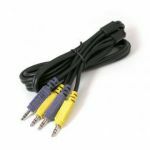 The longer the cable length and the larger the amp, the heavier the gauge required. -Delivers better audio clarity and a more natural sounding midrange with superior-grade, 99.99%-purity copper conductors. 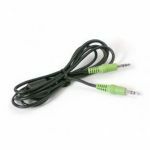 -Generates better high frequencies and a more realistic stereo image using precision-formulated polyethylene dielectric material. -Creates precise contact and increased durability with 4 corrosion-resistant, 24k gold speaker pins.